Play in the 21st Century Kindergarten classroom shouldn't just be an arbitrary assortment of toys. It needs to be well thought-out and planned, tied to the standards, and must include a wide variety of materials to maintain the engagement of 21st Century Learners. In this video we will explore what it takes to plan structured play for the 21st Century Kindergarten classroom and I will outline my yearlong plan for play. Be sure to sign up for email notifications, because this blog series is just beginning! Check back each week for detailed posts about every month of the year! What can you remember about Kindergarten (or first grade for those who didn't attend Kindergarten)? When I think about my Kindergarten experience I'm warmed with memories of playing in the leaves on a fall day, sitting on the carpet listening to my teacher play songs on her guitar, color with fat crayons and writing my name with a fat pencil, heading home after lunch, and lots of playtime. 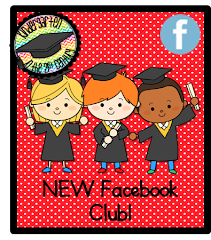 What will 21st Century Kindergarteners remember about their experience years from now? Will they remember taking standardized tests on the computer, learning perfect penmanship after practicing on worksheets, memorizing sight words from long lists, mastering math facts with a pencil and paper, and "Magic School Bus" videos watched from their desks? As teachers and parents is this how we want our Kinders to remember their very first school experience? For me, I can answer that with a resounding, "NO!" 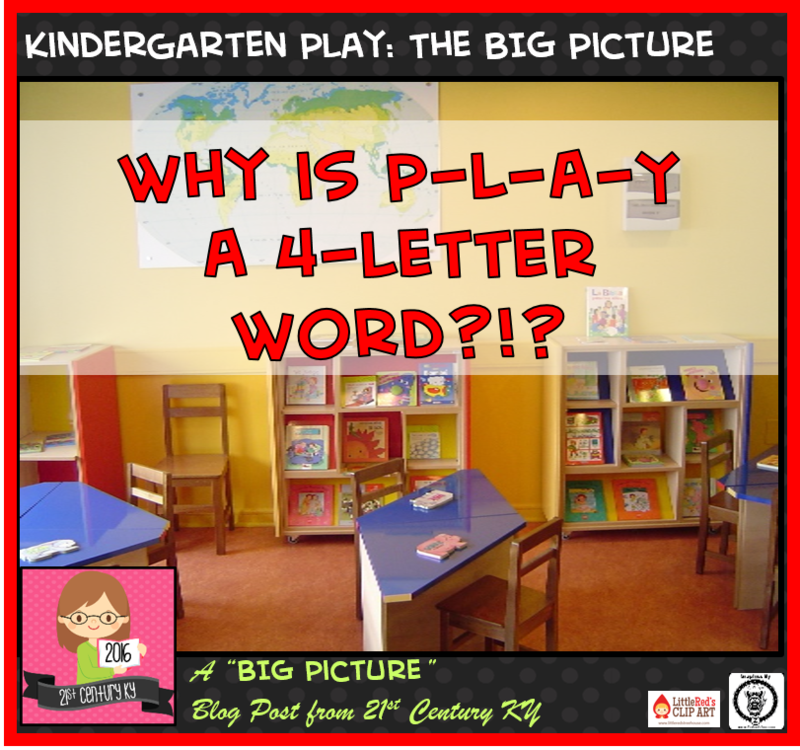 "Why is P-L-A-Y a 4-Letter Word?" 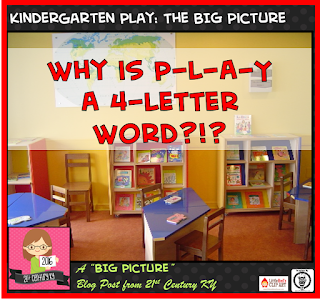 Watch as I discuss how I came to the conclusion that play should NOT be a 4-letter word and should most definitely be included in the daily Kindergarten schedule. Now that we have established the importance of play I know you are asking, "HOW IN THE WORLD DO I FIT IT IN?" That's why I'm SO excited to be planning a new series of posts all about how to implement "structured and choreographed" play in the 21st Century Kindergarten Classroom. Do you already make time for play? What are your favorite play themes? Do you have any questions about how to plan?